Soon the Easter Jackrabbit will be leaving eggs in the wildflowers and cactus. When teaching a seminar, I always try to paint a number of examples and this is one of them that I did for a recent seminar. 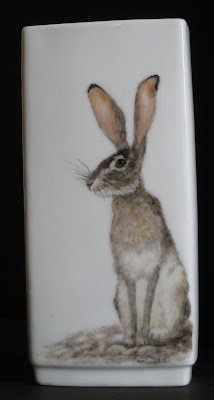 This piece is painted on a rectangular vase. The photo makes it look slanted at the top but it is really not! I haven't painted anything on the back yet. Maybe those eggs in the wildflowers.